Previous postWhy are an increasing number of families choosing Rossall? Malcolm was the eldest son of Ted Harrop, member of Common Room 1944-1970, Housemaster of James House and onetime O.R. Secretary. Mal won a scholarship from the JS and was in Dragon-Crescent House. He was in the School Choir, the 1st XI Ross hockey, 2nd XV Rugby, and was active in school drama. He was one of three CCF cadets to represent the school at the Queen’s Coronation in 1953 stationed in the Mall. He left in summer 1954, having won a place at Pembroke, Cambridge to read History. He did his National Service in the RAF, becoming fluent in Russian at the Joint Services School of Languages, learning wireless operations at RAF Wythall and then spent the rest of his time at RAF Habbaniyah in Iraq. After leaving Cambridge he was briefly a graduate trainee in retailing before moving to Pilkington’s Glass. He was sent by Pilkington’s to Australia where he remained for the rest of his life. Pilkington’s, Australia, was absorbed by ACI, Australian Consolidated Industries, and Malcolm became their Public Relations Officer. He then set up his own company, PR Link, but kept the ACI franchise. He ran the Monsalvat Jazz Festival for several years and the Melbourne Jazz Festival. He also staged the Australian Open Squash Championships in Melbourne and received the Order of Australia for services to conservation, sport, jazz and education. The award honoured his work as co-chairman of the International Public Relations Association world task force on the environment and his authorship of the “Code of Nairobi” which is a guide to communicating on environmental and sustainable development. He encouraged and promoted females in sport and received a Prime Ministerial Women and Sports award in 1994. Mal retired from PR Link at the age of 70 and then decided to embark on a doctorate at La Trobe University. He submitted his thesis on the history of glass making in Australia and received his doctorate at the age of 75. His thesis was then published as “Good things come from glass” and the book was runner up in an economic history prize in Australia. With time now on his hands, Mal realised that the elders in his community needed some stimulation and he was the moving spirit in setting up the Eltham/ Nillimbook U3A. Until recently he was tutoring on the History of Jazz, a passionate interest. Mal married Valerie Hawkins whom he met while working in Liverpool. They were married in Rossall School Chapel by Canon CE Young, his former Headmaster. Sadly he died in Melbourne on Saturday, 16th March after a brave fight with Parkinson’s at the age of 83. Mal is survived by Val and their two daughters, Jacquie, a lawyer and Pippa, an interior designer and two granddaughters, Lily and Ruby. 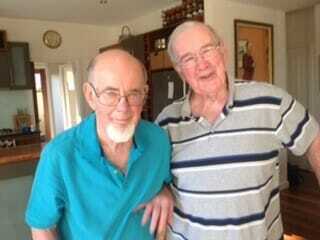 Just before he died, Mal had a visit from his brother John Harrop (JS & DC 48-58). He greatly enjoyed the visit and was “on good form”. John is pictured with Mal and is the author of this piece.